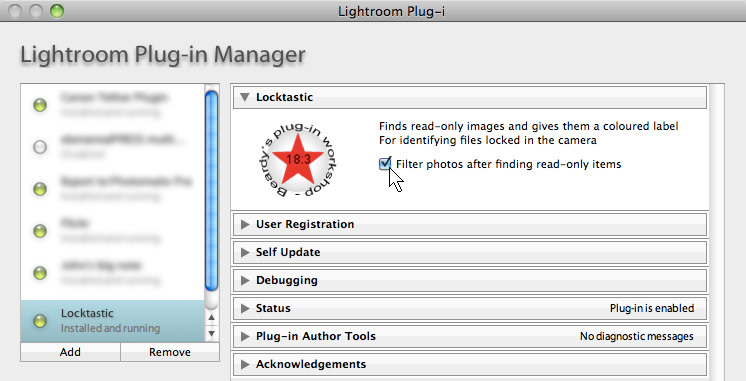 Locktastic is a simple plug-in for Lightroom 2 or later that marks read-only files with the red label. Its purpose is to help photographers who "lock" certain pictures in the camera, making it that little bit harder to delete a good shot. Some do this much more extensively to identify pictures they particularly want to work on when they get back to their desks. 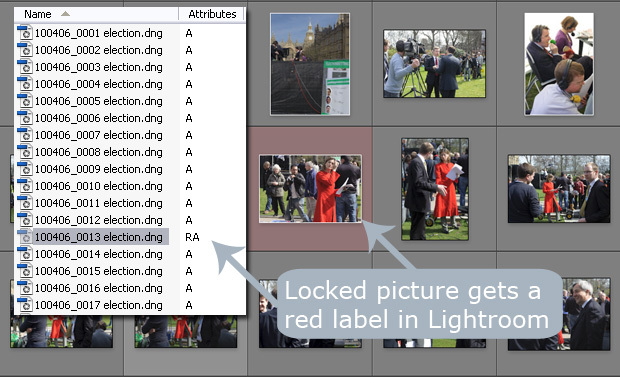 This plug-in helps identify those images once they're in Lightroom. Run the menu command "Library > Plug-In Extras > Locktastic > Label read-only files". The plug-in tests if the file is read-only and changes its label to red. After Locktastic has finished checking the pictures, it can also filter them so that only the read-only files are shown. This is optional, and the preference is set in File > Plug-In Manager. The trial version operates on up to 10 images at a time. Purchasing the plugin will give you a registration code that will remove this restriction. All future updates are free.